Masonry has deep strong roots in the building industry, but it cannot allow itself to become root-bound. Likewise, expertise is not static information or practice. Practical expertise is a moving body of knowledge and experience that supports the confidence and curiosity needed to be open to new ideas - and capable of making the most of them. For over 30 years, we have used brick, block, stone and structural glazed tile to build structures that make our communities better places to live in. 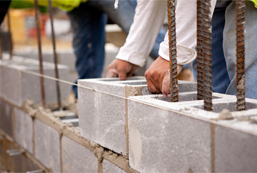 In 2003, we integrated the self-performance of Air-barrier Systems with our masonry operation. In 2012, we began investing in the equipment, training, and experience management personnel needed to self-perform Spray Polyurethane Foam. As building science and construction technology advance, you can rely on our innovative and practical expertise in Masonry and Air-barrier Systems regardless of how complex your project may be.